In this quickstart, you'll configure the Azure ATP sensor settings to start seeing data. You'll need to do additional configuration and integration to take advantage of Azure ATP's capabilities. An Azure ATP instance that's connected to Active Directory. A downloaded copy of your ATP sensor setup package and the access key. After the Azure ATP sensor is installed, do the following to configure Azure ATP sensor settings. Click Launch to open your browser and sign in to the Azure ATP portal. In the Azure ATP portal, go to Configuration and, under the System section, select Sensors. Description: Enter a description for the Azure ATP sensor (optional). All domain controllers whose traffic is being monitored via port mirroring by the Azure ATP standalone sensor must be listed in the Domain Controllers list. If a domain controller isn't listed in the Domain Controllers list, detection of suspicious activities might not function as expected. At least one domain controller in the list should be a global catalog. This enables Azure ATP to resolve computer and user objects in other domains in the forest. For Azure ATP sensors, all network adapters that are used for communication with other computers in your organization. For Azure ATP standalone sensor on a dedicated server, select the network adapters that are configured as the destination mirror port. These network adapters receive the mirrored domain controller traffic. The domain synchronizer is responsible for synchronization between Azure ATP and your Active Directory domain. Depending on the size of the domain, the initial synchronization may take time and is resource-intensive. Azure ATP recommends setting at least one domain controller as the domain synchronizer candidate per domain. Failure to select at least one domain controller as the domain synchronizer candidate means Azure ATP will only passively scan your network and may not be able to collect all Active Directory changes and entity details. At least one designated domain synchronizer candidate per domain ensures Azure ATP is actively scanning your network at all times and able to collect all Active Directory changes and entity values. By default, Azure ATP sensors aren't domain synchronizer candidates, while Azure ATP standalone sensors are. 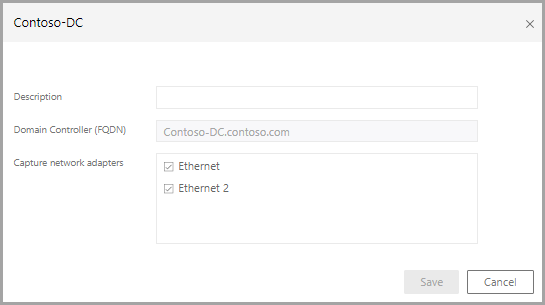 To manually set an Azure ATP sensor as a domain synchronizer candidate, switch the Domain synchronizer candidate toggle option to ON in the configuration screen. It's recommended that you disable any remote site Azure ATP sensor(s) from being domain synchronizer candidates. Don't set read-only domain controllers as domain synchronizer candidates. For more information about Azure ATP domain synchronization, see Azure ATP architecture. Check that the service named Azure Advanced Threat Protection sensor is running. After you save the Azure ATP sensor settings, it might take a few seconds for the service to start. If the service doesn't start, review the “Microsoft.Tri.sensor-Errors.log” file located in the following default folder, “%programfiles%\Azure Advanced Threat Protection sensor\Version X\Logs”. The version of Azure ATP updates frequently, to check the latest version, in the Azure ATP portal, go to Configuration and then About. Go to your Azure ATP instance URL. In the Azure ATP portal, search for something in the search bar, such as a user or group on your domain. Make sure to replace contosodc.contoso.azure and contoso.azure with the FQDN of your Azure ATP sensor and domain name respectively. Repeat steps 3 and 4 for each sensor you wish to test. From the Azure ATP console, open the entity profile for the computer you ran the connectivity test from. Check the related logical activity and confirm connectivity. If the domain controller you wish to test is your first deployed sensor, wait at least 15 minutes to allow the database backend to finish initial deployment of the necessary microservices before you attempt to verify the related logical activity for that domain controller. Have more questions, or an interest in discussing Azure ATP and related security with others? Join the Azure ATP Community today!